The objective of these reports is to provide users with a means of assessing the relative condition of crops and grassland. The maps can be used to assess current plant growth rates, as well as comparisons to the previous year and relative to the 25-year average. The report is used by individual farmers and ranchers, the commodities market, and political leaders for assessing factors such as production potential and drought impact across their states. Figure 1. 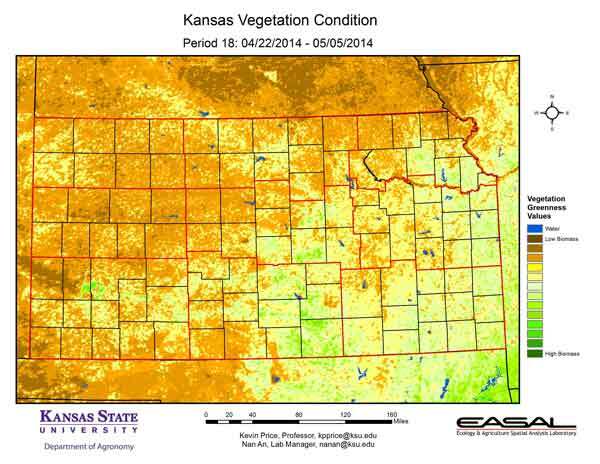 The Vegetation Condition Report for Kansas for April 22 – May 5 from K-State’s Ecology and Agriculture Spatial Analysis Laboratory shows that vegetative activity is limited. The greatest activity is confined to south central and central Kansas, where winter wheat is in active development. Much of the wheat in these areas is approaching or at the heading stage. Figure 2. 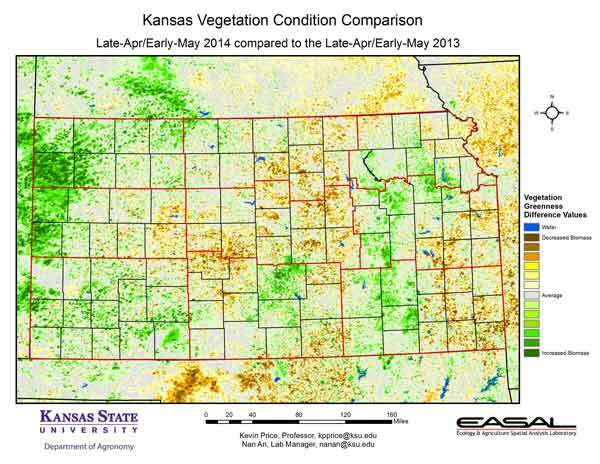 Compared to the previous year at this time for Kansas, the current Vegetation Condition Report for April 22 – May 5 from K-State’s Ecology and Agriculture Spatial Analysis Laboratory shows that northwest Kansas has the greatest increase in vegetative activity. Much of this is the result of the September moisture, coupled with the extremely poor conditions that prevailed last year. It does not indicate particularly good conditions this year. Figure 3. 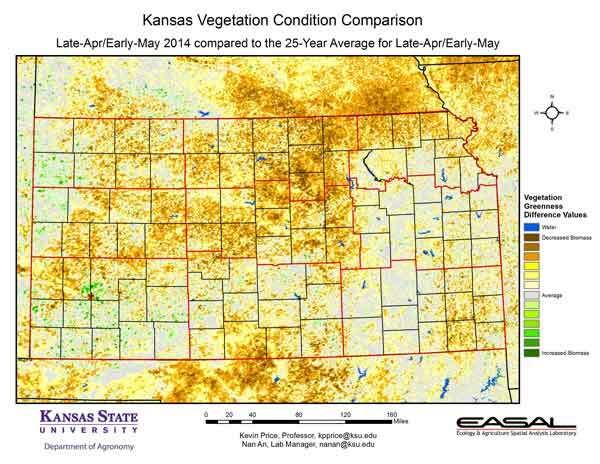 Compared to the 25-year average at this time for Kansas, this year’s Vegetation Condition Report for April 22 – May 5 from K-State’s Ecology and Agriculture Spatial Analysis Laboratory shows much of the state has lower-than-normal vegetative activity. In central and north central Kansas, the cooler and drier conditions have resulted in much lower biomass production than usual. Figure 4. 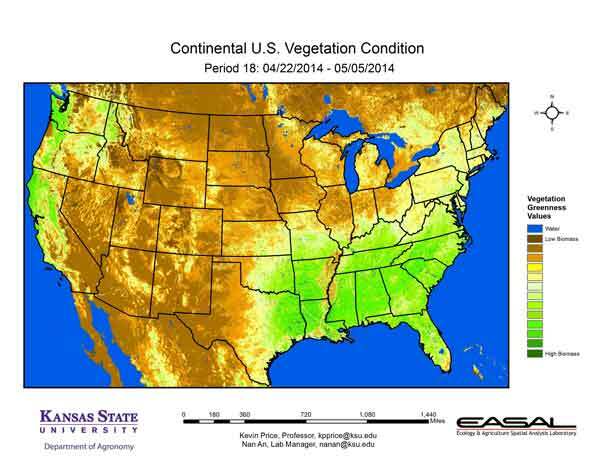 The Vegetation Condition Report for the Corn Belt for April 22 – May 5 from K-State’s Ecology and Agriculture Spatial Analysis Laboratory shows that photosynthetic activity is confined to the southern portions of the region. 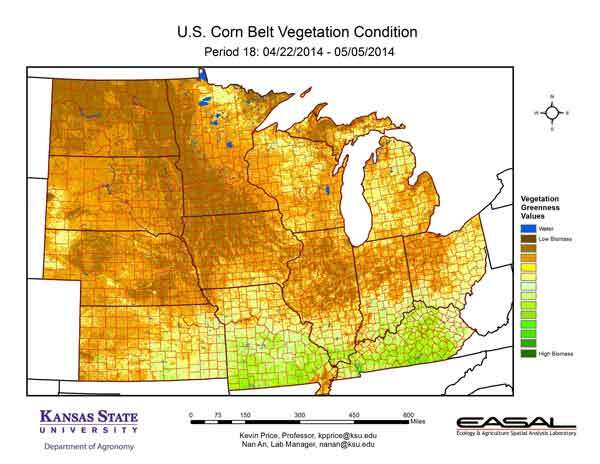 Continued cool weather has slowed development in the northern portions of the Corn Belt. In Iowa, both oat and corn planting was reported to be significantly behind average. Figure 5. 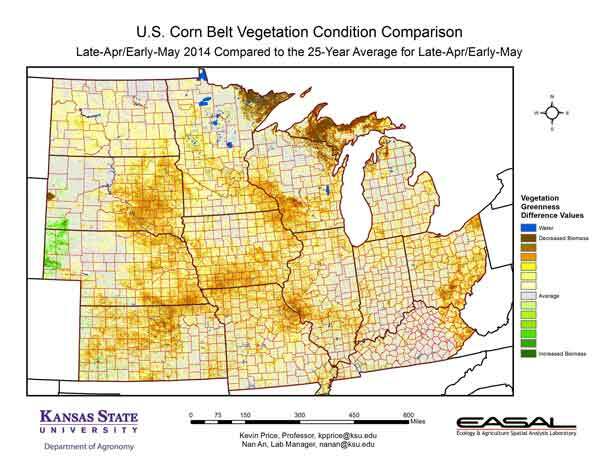 The comparison to last year in the Corn Belt for the period April 22 – May 5 from K-State’s Ecology and Agriculture Spatial Analysis Laboratory shows South Dakota has the widest area of increased biomass productivity. Last year in South Dakota only 6 percent of the wheat was reported in good condition. This year the report has 62 percent of the wheat in good condition. Figure 6. 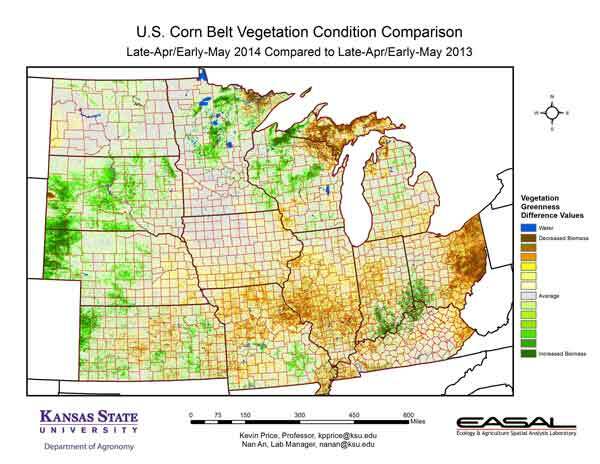 Compared to the 25-year average at this time for the Corn Belt, this year’s Vegetation Condition Report for April 22 – May 5 from K-State’s Ecology and Agriculture Spatial Analysis Laboratory shows that the most extreme area of below-average biomass productivity is in the northern Great Lakes region. Cool temperatures and lingering snow cover are the major deterrents to vegetative activity in these areas. Figure 7. 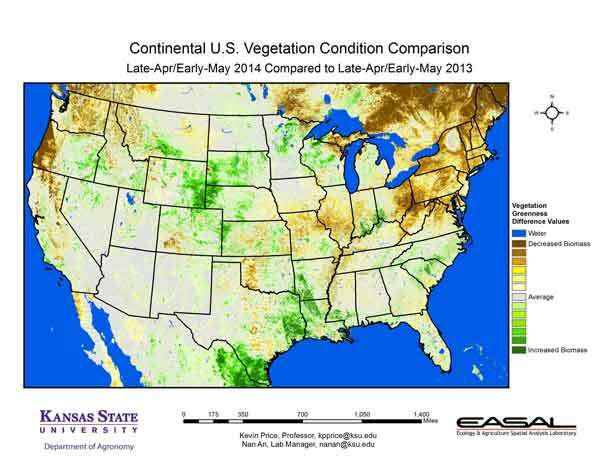 The Vegetation Condition Report for the U.S. for April 22 – May 5 from K-State’s Ecology and Agriculture Spatial Analysis Laboratory shows that the greatest level of vegetative activity is in the South and the Pacific Northwest. For the South, favorable to excessive moisture and mild temperatures have help biomass production. For the Pacific Northwest, shrinking snow packs have resulted in more vegetative activity, with increasing drought concerns. Figure 8. The U.S. comparison to last year at this time for the period April 22 – May 5 from K-State’s Ecology and Agriculture Spatial Analysis Laboratory shows that New England and the Pacific Northwest have lower biomass production than last year at this time. The greatest increase in productivity is in western Nebraska and eastern Wyoming. In these areas, snow cover is not as great as last year, and temperatures are slightly warmer. Figure 9. 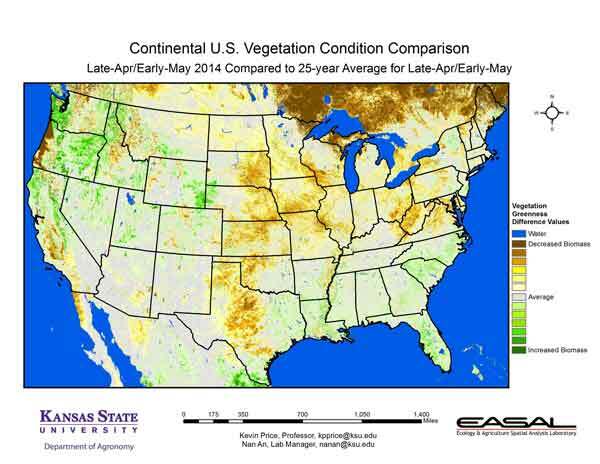 The U.S. comparison to the 25-year average for the period April 22 – May 5 from K-State’s Ecology and Agriculture Spatial Analysis Laboratory shows that below-average biomass production is most pronounced from the Central Plains to central Texas. On the north end of the region, cooler-than-average temperatures have delayed productivity; on the southern end of the region, drought is the major culprit in below-average activity.